As posted on the Brantford Expositor website, July 11, 2012. 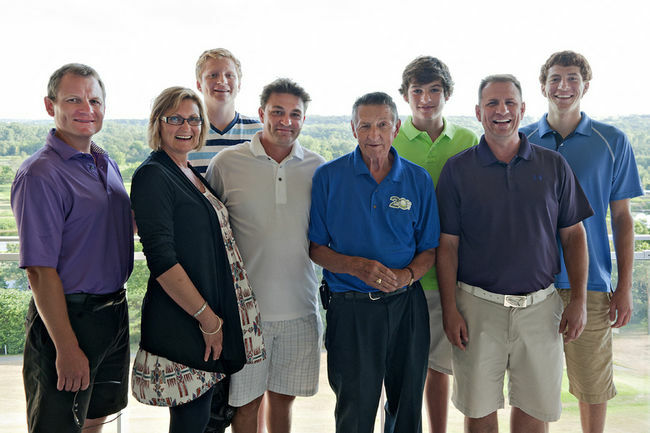 The final Walter Gretzky CNIB Golf Classic was capped with plenty of laughs, a sprinkling of tears and more than a few dollars. A second auction Tuesday night of several sports memorabilia items brought in another $4,700 for the cause as the 20-year event ended its successful run. "I spent this morning counting money," organizer Sue Bartlett said Wednesday. "A lot of the bills haven't come in yet, so I don't have a final figure. But I think we'll do at least the same if not better than last year when we raised $65,000." That pushes the 20-year total for the local event close to $1.3 million for the Canadian National Institute for the Blind. The hottest auction item Tuesday was Adam Henrique's New Jersey Devils jersey that was signed and modelled by the NHL rookie of the year nominee. Bartlett said that Deena Denton-Wojtowicz of Guelph said she would increase her bid if Henrique put on the jersey and give her a hug. "It ended up she was outbid and the jersey went for $1,200." Walter presented Henrique with the tournament's Award of Merit, which honours locals who have proven themselves on a wider stage, excelling in their particular field. Henrique joins sports figures such as former NHLers Doug Jarvis, Pat Hickey, Keith Jones, Chris Gratton and Jay Wells. Other winners of the award have included runners Rick Mannen and Kevin Sullivan, biker Jordan Szoke, golfer David Hearn and swimmer Julie Howard Johnson. From the world of entertainment, comedians Phil Hartman and Gord Paynter were honoured, along with choreographer Debra Brown. Journalists Arnold Anderson, Ted Beare and Ed O'Leary also got the award. And Wayne and Walter Gretzky were honoured in 1999 and 2002 with the award. After receiving the award, Henrique made a heartfelt speech about the event and the influence of the Gretzky family, including Walter's work and Henrique's memories of Glen Gretzky, who was one of his minor hockey coaches. "He was fabulous," Bartlett said of Henrique. While Henrique's jersey got the top spot in Tuesday night's auction, there was plenty of action around a signed and framed Sidney Crosby jersey and a replica of the Stanley Cup - complete with white gloves. The high bidder for that item is the owner of the Wayne Gretzky restaurant in Toronto. He was able to get Johnny Bower's signature on the item, since the 87-year-old former NHLer was at the gala. Bower was last year's recipient of the tournament's Dan Gallagher Memorial CNIB Friendship Award. This year, the award went to Brian Mandell, a past chair and member of the local CNIB board and treasurer of the golf classic for many years. Mandell also volunteered at the auction and the golf tourney this year. The Hella Goreski Memorial Award, which is presented to someone who has gone above and beyond the call of duty during a particular tournament, was given to Heather Roswell and Joe Persia. "Heather did so much this year, even knowing she wouldn't be at the event," said Bartlett. "She's been in Sri Lanka with a program called Sleeping Children Around the World. And Joe, who was our emcee and worked on the committee through the year, was unaware he would be receiving the award and was left speechless." The day's winning foursome came from Peller Estates, led by John Peller, grandson to founder Andrew Peller. Peller carries Wayne Gretzky Estates wines. The Gretzky family also presented Ron Finucan, who recently retired from the CNIB, with a Muskoka hockey stick chair for his years of acting as a liaison for the family. A CNIB representative offered thanks from the organization to Walter Gretzky, who not only lent his name to the Brantford tournament but has toured the country, playing in a handful of other Gretzky tourneys set up to benefit the agency. Walter was presented with a specialized vase covered in braille words of love. 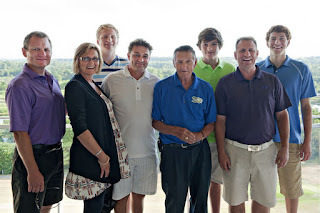 Each of the golfers in the final tournament were given a special Walter Gretzky hockey stick that lists all the tourneys and his many awards and recognitions, including the Order of Canada and Citizen of the Year. Walter signed each stick. A regular at the event who was missing this year was musician Sab - Pete Sabourin - who is know as "the original outlaw rocker," said Bartlett. "He's been a fan favourite for many years but is fighting leukemia. He called me this morning wanting to know how the event went, even though he's going back in the hospital tomorrow for a bone marrow transplant." Bartlett said she will send one of the special hockey sticks and copies of the various programs to Sab. Anyone who wants to include any other items or good wishes, should contact her. Glen Gretzky said the entire final event was awesome. "It couldn't be a better event for Brantford. It was just great. Everyone is sad that it ended, but everything comes to an end." Glen noted that Bartlett deserves a lot of thanks for helping organize the tournament for the past 17 years. "Without Sue Bartlett there would be no tournament." Bartlett offered her own thanks to the entire community for supporting the event. "It's grown so much over the years and been so successful. And it's all due to the support of the community, the celebrities, the committee and volunteers and, of course, Walter."